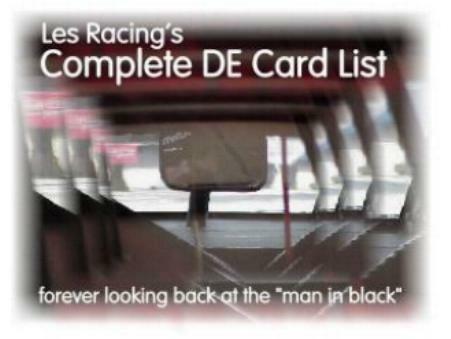 As a racing card collector that collects just about every racing set, I have built a little checklist page to help me with my wants list for each set I collect. It's a great tool to use, especially for the set collectors. Below is a picture of what the page looks like. Feel free to copy the file(s) to you computer and print your own page each time you need one. It's very easy to do and can be placed into a folder and carried with you to card shows, or shops where you may find cards for your wants. The checklist is designed to cover all of the cards (base, inserts, etc.) that were included in each release you need it for. I keep my pages in folders for quick and easy access. You never know when at a moments notice you want to run to a card shop or a friends house to do some trading!!! It's simple to use. Print out a page, fill in the Year, Brand & Product name on the top of the sheet. The left side number box is used for the "common or base cards" and is numbered from 1-300. I usually put an "____" under the highest number base card for the set. 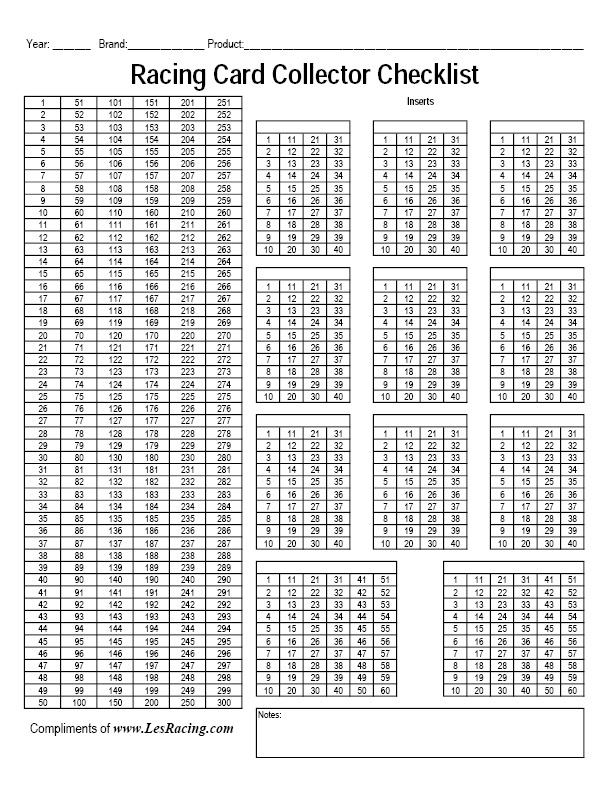 IE: if the set has 120 base cards, place an ____ under the number 120 and this shows the ending number for the base set. Then as you collect all of the base cards, strike a line "----" through the middle of the number signifying that you have the card. For Insert cards, designate one box for each insert set that was released in the product. An open header has been left to write the name of the insert. IE: Tradin' Paint, Head Gear, Head Gear Trans, etc. Then follow the same instructions as described above for base cards. Lastly, there is a Notes box where you can add notes sepcifically about cards in the release. IE: the set may have been listed to include 270 base cards, but actually only had 269 cards in the release (sort of like the 1995 Maxx set that was missing card #35 because it was never printed). I hope this little checklist of mine will help you with your collecting. Thanks for visiting my site and ENJOY!!! The links below are "direct" to the file(s). This means when you right-mouse click as the directions state, you will be shown a "File Save As" dialog (pop-up) box. If you are unfamiliar with saving files, you might need to change the location of where the file(s) will be saved. Usually on the left-hand side of this box you can click on "My Documents" or "Desktop" -- this is where I suggest to save the file(s) so that they are easily found. If you are familiar with saving files, then go ahead and save the checklist where it is most convenient for you. Also, if you left-mouse click the links, one of two things will happen. 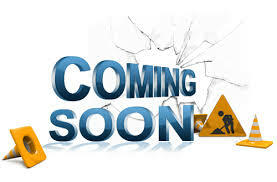 The PDF link will open a new web page that shows the PDF. If this happens you can hit the save as button (if you have one on the page) or right-mouse click and select "Save As". The PDF link might (depending on your browser) open a "File Download" dialog (pop-up) box, and the Excel link will usually always open the "File Download" dialog box. On this box, click the Save button. Either way, you may still need to change the location of where you want the file to be saved as described above. To save as a PDF file: right-mouse click here and select "Save Target As..." from the pop-up menu. To save as an Excel file: right-mouse click here and select "Save Target As..." from the pop-up menu.